In a blatant act of transgression against the population of the world and real science, the agricultural equivalent to the ‘Nobel Peace Prize’ known as the World Food Prize has been given to a Monsanto executive and two associates for their role in the development of genetically modified crops. Robert Fraley, the chief technology officer at Monsanto, will be given $250,000 cash along with his prestigious award that was presented at the US State Department on Wednesday. It’s ironic, really, because the US State Department just so happens to also be using our tax dollars to market Monsanto internationally with promotional marketing DVDs and pamphlets. To put it simply, they quite literally act as a marketing wing for Monsanto — the corporation that might as well be a government entity. It is rather fitting, then, that Monsanto’s executive be adorned with the World Food Prize along with a sack of cash at the headquarters of the Monsanto marketing wing that is the US State Department. But of course there are also two other scientists being honored for their works against human and environmental health, so it’s important to also identify these corporate scientists as well. First up you have Mary-Dell Chilton, who founder of the rising star biotech company Syngenta, the same great company charged for covering up the fact they knew their own GM corn had been killing animals after consumption. An admission that would ultimately doom their bottom line profits and unveil the reality that Syngenta’s GM crops are indeed unfit for consumption. As for the third scientist, Marc Van Montagu, he is a European cheerleader for GM crops who founded the Institute of Plant Technology Outreach at Ghent University in Belgium in order to help Monsanto get a stronger foothold in European nations that reject GM crops. So why have these individuals been given a World Food Prize, especially when over 900 scientists working under the United Nations were forced to admit after extensive research that GMOs lead to decreased yields and are easily outperformed by traditional farming with ease? Probably the same reason that the US government continues to support Monsanto despite complete public disapproval and outcry. “These three scientists are being recognized for their independent, individual breakthrough achievements in founding, developing and applying modern agricultural biotechnology,” said foundation head Kenneth Quinn. It’s time to stop Monsanto and GMO crops at large. Take part in the Monsanto Video Revolt, an initiative I am launching along with Mike Adams of NaturalNews and Dr. Edward Group of Global Healing Center. It’s time to tell Monsanto to get out and turn activism into legislation. Join the Monsanto Video Revolt right now and get the word out by uploading your videos against Monsanto in online revolution. These Nobel Prices are a laugh. Nobel Peace price to killers in government. Now this kill the population through food, one bite at the time. No scruples of what they are doing to our children. I wonder whar are they feeding their families? In Europe testing was done in several nations, they were checking the people's urine, an ingredient in round up from Monsanto was in their urine. This is total insanity and needs to be stopped. The same counts what they are feeding farm animals and the use of anti biotics and growth hormones. With all these anti biotic resistant bacteria we don't want anti biotics in our food. The more powerful a corporation becomes the more government officials they are able to corrupt, kind of like a snowball going downhill, only this is a turd. 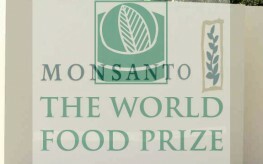 When a person like a Monsanto executive receives the Nobel Prize, it is a very disrespectful to such a prestigious award like the Nobel Prize. A winner of a Nobel Prize is one who discovers or leads to a discovery that will help us, our environment and generations to come to live long, happy and healthy lives in concert with a healthy environment..
Monsanto has made discoveries to disrupt our environment that are leading to the demise of this planet. How can someone belonging to a SATANIC organization whose only intent is to kill all living matter including humans receive such a prestigious award? Whoever thought up the idea of presenting this award to someone belonging to this Satanic organization must be eating too many GMO's. Who would do such a dishonourable thing as presenting this prize to Satan? I see the silver lining. This is the parasite that will take down corporate farming in America. Literally everyone I know is growing gardens this year, building greenhouses and buying locally grown organic food. Eventually corporate grown food will be nothing but a political weapon. They should start calling it the "Death Prize"! It's been a joke for years already! Well, i guess the NOBEL PEACE PRIZE isn't what is used to be, if it's awarded by morons to morons. Truly disgusting. I pray there is a hell for these people. Greedy spawns of the devil. I say let's make a hell for them right now! Honestly our government has made its bed and now needs to sleep in it. This is a disgusting use of $250,000 and someone needs to go to jail for this abuse of power. Monsanto is going to kill the youth of America, one meal at a time. Thank you for the info. This has to be a joke of some kind. It can not possibly be true! Our own government trying to poison us? They are out of their minds! If Monsanto is trying to help farmers why he do a terminator seed on weeds????????? Of course not he is to monopolize the food chain. Why other country’s allow GM with out them asking for conditional test do in private research. Why Monsanto do not show us in public his private research, that he affirm that GMO is totally safe? Thanks for this article. Now, we know of three names(Robert Fraley, Mary-Dell Chilton and Marc Van Montagu) associated with the destruction of human and environmental health. Glad to get the word out and expose this nefarious corporation that rightfully deserves the name Monsatan, Shane.